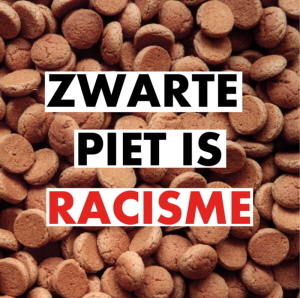 In 2016 Doorbraak activist Jennifer van Leijen initiated a campaign to stop the Dutch government from subsidizing blackface (Zwarte Piet or Black Pete) on children’s television. More than 12.000 people already signed. Van Leijen regularly writes updates. Here is number 17 (also read numbers 1, 2, 3, 4, 5, 6/7, 8, 9, 10, 11, 12, 13, 14, 15 and 16). In the United States there are people who know that blackface is wrong, there are some who don’t, and there are people who know but sit on the fence when it comes to taking action. Last weekend there were protests against the response of the president of the California Polytechnic State University (Cal Poly), Jeffry Armstrong, to a student in blackface. He claimed that the racist behaviour was the equivalent of “free speech”. Professor Neal. A. MacDougall, who works at Cal Poly, said that there was a racist culture at the university and has started his own petition on Change.org to get rid of Armstrong. It’s worth signing MacDougall’s petition because it’s unacceptable, for example, to allow a hate speech speaker like Milo Yiannopoulos to visit your educational establishment (one of the things that Cal Poly has done under Armstrong). Armstrong downplayed blackface, but blackface is not merely expression; blackface is bullying because it effectively ridicules a person’s dark skin colour. And when an establishment accepts the existence of bullying, it aligns itself with the bully. All students should feel safe and comfortable in their place of study. The student, Kyle Watkins, who had done the blackfacing, responded with more grace than the college president himself. Watkins wrote in a statement that he hadn’t known about the phenomenon of “blackface”. After educating himself about it, Watkins understood both that it was wrong, and why it angered people, and he apologised. I personally wish that the Dutch government could learn from Watkins, that is, the Dutch government need to educate themselves, admit that blackface is wrong, and say that they won’t subsidise it again. The Dutch government on the one hand subsidises blackface on children’s television, and on the other hand say that they are leaving it to Dutch society to decide. The Dutch government won’t take a stand. The problem is that Dutch society doesn’t understand that discrimination happens even without intention. A policeman who shoots an unarmed black person doesn’t necessarily think “He’s black, I’ll shoot him”. It’s possible that the policeman merely has a different expectation of how black people will react compared to white people. The policeman acts according to race, and not according to objective criteria. This means that a person can easily discriminate without intending to. Intention is therefore irrelevant in ascertaining discrimination. Dutch society is full of people who claim to be innocent because their intentions are good, but these same people continue to actively discriminate. It has far reaching consequences on many peoples entire lives. Being treated unfairly, being discriminated against, means that people with a dark skin colour are denied access to education, work, housing. Starbucks’ recent response to a racist incident shows that they are taking discrimination seriously. Starbucks announced this week that they will close 8.000 stores to educate their staff with racial implicit bias training. But in the Netherlands, where blackface sells (for example, the blackface children’s television company sells lesson material to schools, and is involved in the making of live minstrel shows), a global fastfood chain like McDonald’s can sponsor the blackface parade (called Sinterklaasintocht) in The Hague for years, without being criticised. The parade involved hundreds of volunteers in blackface. Thank you, supporters, for being involved in this anti-discrimination fight by signing this petition. Just as it took one woman reporting what happened in Starbucks to have a far reaching domino effect, you too are actively doing something that will help to be a force for change!